Throughout Bioshock Infinite Booker and Elizabeth are chased by the entity called Songbird. 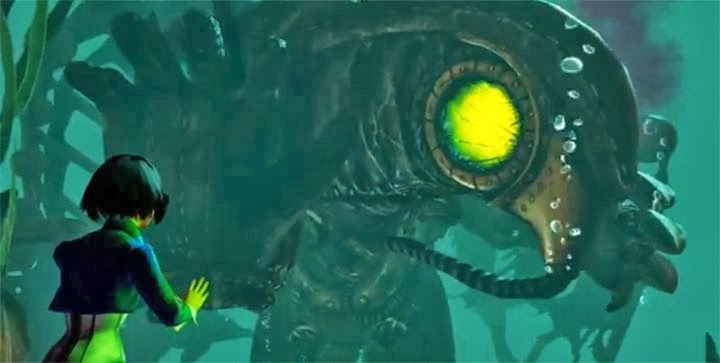 Evoking the Big Daddy and Little Sister relationship of the earlier Bioshock's, it made me wonder- who is in the Songbird? These holes have shown me yet another wonder, though I’ve yet to see the application for it. They illuminate a merger of machine and man that is somehow the lesser, yet the greater, of both parties. The process seems to be irreversible. Perhaps, though, Comstock will have some need of this kind of thing to keep watch in that tower he is building. The implication being that Fink may have seen Big Daddies and based the Songbird on it. Furthermore, if he did use another being in it, why was it so protective of Elizabeth? (I also like the Big Daddy and Little Sister in the background of the scene of Songbird's death) It would be worth mentioning that during the death scene blood comes out of the Songbird- see pic above. Here's what I'm thinking- mind you this is kind of far fetched- it is based on complete guesswork. Granted the Elizabeth in the suit theory is highly implausible, but a Booker or Comstock from another time or universe would be highly possible. Anyways, this is just me thinking about the Bioshock Infinite game, and possible connections to the DLC. Then again, would Fink have let on if he had help from another Elizabeth? He was essentially pilfering tech from other universes... then again, with Comstock's resources he may have found another interesting person to fill the role for Fink. I don't know- there are a few paradoxical issues I have with the end of Infinite anyway, so I'll post more stuff about this later.